Classroom jobs allow children to experience responsibility, self-worth, inclusion, accomplishment, and unity. When creating classroom jobs, it's important to ask yourself, "How will this job contribute to the greater good of the classroom?" and "What skills will this job help a child build?" 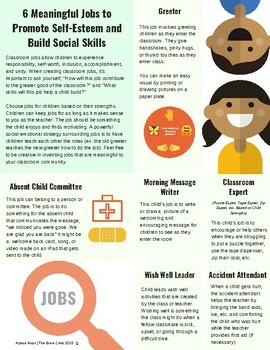 Here are 6 tried and tested jobs that build social-emotional skills and help children feel like a meaningful member of your classroom communities.